I was so surprised not to see the Three Sisters Waterfall in Descanso, CA (San Diego County) on your list & then remembered it’s a fairly well kept secret. 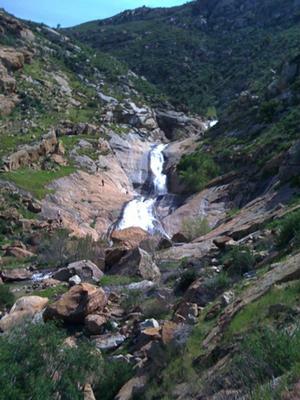 The falls are in the middle of the Cleveland National Forest down 12 miles of dirt road. (Exact directions are easy enough to find online.) But the road does cross through 2 potential rivers that are impassable in the winter & rains. The hike to the falls is only about 3 miles round trip but the climb is very steep requiring either some minor bouldering or use of a rope left by other hikers. Still if you bring enough water and take your time, it’s not too difficult. It is called Three Sisters because there are 3 tiers to the falls before it becomes a river that snakes through the valley. The sound of the falls can be heard from over a mile away so it’s easy to know when you’re on the right trail. I’m not positive of the exact height but I’d guess it’s probably about 200′ high counting all 3 tiers. Go in the spring and you’ll also see an amazing display of California Poppy on the hill sides. The photograph I took is about 15 or so minutes walk from the base of the falls. There are also pools of water at the base so if you arrive on a hot day, feel free to take a dip. While these falls do shrink through warm weather, they exist year round.